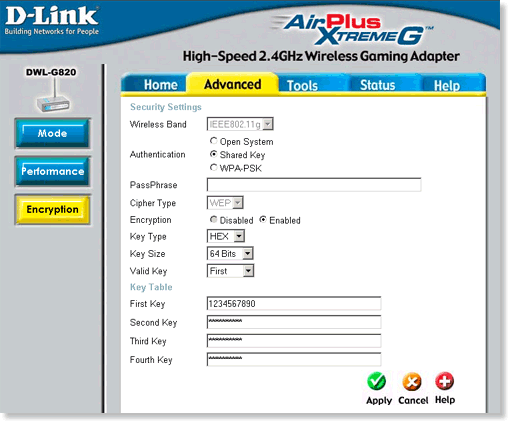 It is recommended to enable encryption on your wireless access point before your wireless network adapters/bridges. Please establish wireless connectivity before enabling encryption. Step 1 Open your web browser and type the IP address of the DWL-G820 in the address bar. The default IP address is 192.168.0.35. At the login, enter your username (admin) and password (default password is blank). Step 2 Click on Advanced and then click Encryption on the left side. Step 3 Click on the Shared Key radio button. Next to Key Type, select Hex or ASCII. When using different brand wireless products, it is strongly suggested to use Hex. Step 4 Next to Key Size, select the level of encryption. Step 5 Next to Valid Key, select First. In the box, enter a HEX key (a random encryption key that you make up). The length of the encryption key will depend on what you selected under WEP Encryption. The Hex key must be exactly the same on all your wireless products. 152-bit encryption 32 charactersThe encryption key is HEX, meaning 0-9 and A-F are valid characters. Step 6 Click Apply to save your settings. Note: You will now need to use the same encryption key on all other wireless devices you wish to communicate on this wireless network.